In Insurgent, we rejoin Tris Prior as she and the friends and family she has left run to Amity (the kindness faction). Throughout the novel, she must continue trying to save those she loves—and herself—while grappling with grief and forgiveness, identity and loyalty, politics and love. War looms as conflict between the factions grows. Tris finds herself transformed by her own decisions but also by grief and guilt, new discoveries, and shifting relationships. Overall, I enjoyed Insurgent. I liked the direction the plot took and followed along eagerly, consuming the book quickly though not with quite as much vigor as I did the first. I loved seeing how other factions lived and how their beliefs supported their way of living, which really fleshed out the world for me. Character development was generally well done: Christina reacts realistically to Tris’ betrayal and killing of Will, Peter is largely what I expected, and Marcus (Four’s father) is something very unexpected. The new characters we meet are compelling and their stories made me want to keep reading—especially with the introduction of Four’s supposedly dead mother, Evelyn. The Factionless play a huge part in Insurgent. I found the juxtaposition with the factions and the Factionless interesting and well-done. The novel deals with a lot—human nature, control, power, and more. I loved the power struggle, the determination of many of the characters to do what they deem to be the right thing. It leaves the reader wondering—what is the right thing? Is anyone doing the right thing? I found it to be a bit of a commentary on the world that we live in: everything is a shade of gray and humans are not inherently good. Or are they? Tris’ grief over the death of her parents and Will transforms her. The brave, sweet Tris who won me over heart and soul in Divergent is an angsty teenager and a bit of a stranger. Yes, grief transforms people, and while I understand her depression, it felt limiting and forced her to make selfish and rash decisions. I expected more from her as a character—regardless, she does pull through and retains the core of her identity—strong, brave, and selfless. In the end she is able to do the right thing despite what is happening around her. Another character who surprised me was Four—although, not in a good way. I loved his character in Divergent. He was strong and brave and he pushed Tris in all the right ways, but in Insurgent I found a character who is suddenly aggressive. He had been cool even in a crisis, but his character is suddenly flying off the handle. I struggled with this—I felt that Roth was pushing him in a direction that she needed him to go in for the sake of the story, rather than letting his character unfold naturally. Four, who seemed to very much understand Tris and her needs in the first book, handles her harshly and thoughtlessly in the second. The author intrusion in Insurgent made my initial love of Four dwindle. 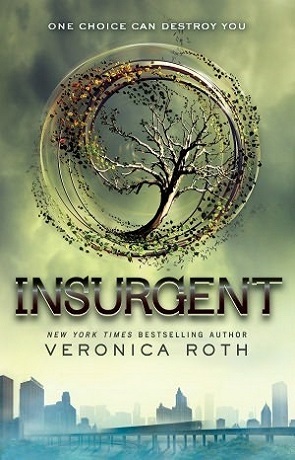 Despite the shortcomings that I found in Insurgent, I enjoyed the novel and would recommend the second book to friends. It’s still fast-paced, interesting, and rife with character development and real, true characters. It leaves us with a cliffhanger (in true Divergent style) and leaves the reader wanting more. Written on 19th May 2014 by Vanessa.